These flesh-eating monsters give all new meaning to the words "angry birds". Based on its title, there should be no confusion over Shoot The Zombirds' primary objective. This macabre shooter casts players as a pumpkin-headed creature, tasked with protecting the adorable pumpkids from the feathered undead using arrows, the better to pierce the creatures' rotting hearts with. It's entertaining, delightfully casual and visually stimulating, especially if you wish Halloween were all-year round. That said, getting the hang of things is easy. 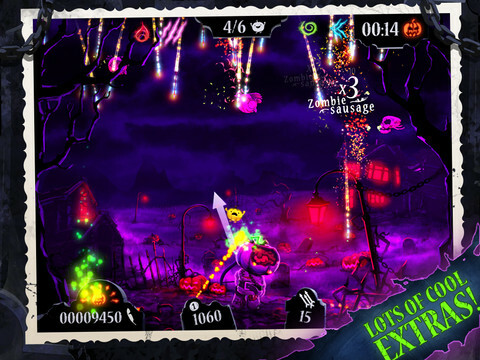 Zombirds travel back and forth across the screen at various speeds, and you pull back and let those arrows fly. Taking down as many birds as possible will result in points, but you really want to target the ones carrying the terrified pumpkids, as there's a set number of little guys you can afford to lose. Otherwise, the game immediately ends. At the same time, you only have a limited amount of arrows, so it's in your best interest to hit consecutive targets, whereupon which you retain the precious ammo; basically, don't miss. Naturally, it's easier said than done as the Zombirds pick up speed and come in various sizes. The big fat ones stand out like a sore, flesh-picked thumb, but the tiny buggers are by far the most annoying, as they travel the quickest. At least on the positive side, hitting skulls results in gold coins added to your virtual bank account, which you can spend on a handful of upgrades, from beginning games with more arrows to temporarily freezing the Zombirds in place. Or, you can trade the cash for a Skeleton King costume or Mummpkin Wraps (think mummy); you can earn coins through playing the game, or pick up more through in-app purchase. All told, a deceptively simple and well-made video game that immediately brings to mind memories of the fall, filled with haunted houses, jack-o-lanterns and assorted things that go bump in the night. And thanks to leaderboards, we have a feeling that Shoot The Zombirds will be a personal favorite for quite some time. 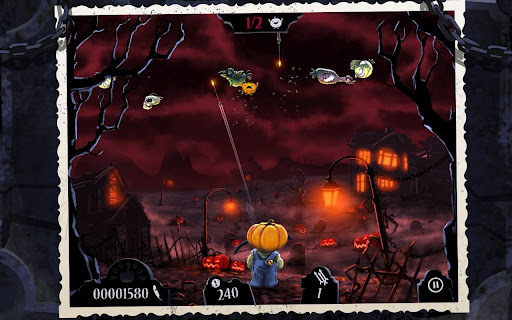 What's Hot: Simple and addictive shooting mechanics, Halloween-style artwork, power-ups and costumes, cute pumpkids. What's Not: Only one mode, needs more costumes.